A small sea chest, fun-a­dansu, of kakesuzuri type. The chest is constructed from paulownia wood and is covered in iron mounts that are attached to the wood by small metal pins. The chest has a single door, hinged on the right­-hand side with five elaborate metal hinges. The door is richly decorated with iron mounts, partly executed in openwork and one incorporates a japanese character. The interior is fitted with two large drawers with rectangular bail handles over two smaller drawers, each with a ring pull. The smaller drawers are individually lockable. Behind the left-­hand drawer on the bottom is a hidden money box with a sliding top. The main hinged door has a complicated double locking mechanism. The chest has a single bail handle on the top. The wood is of warm deep brown colour with a rich patina. This type of heavy chest is referred to in Japanese as a fun-a­dansu or sea chest. 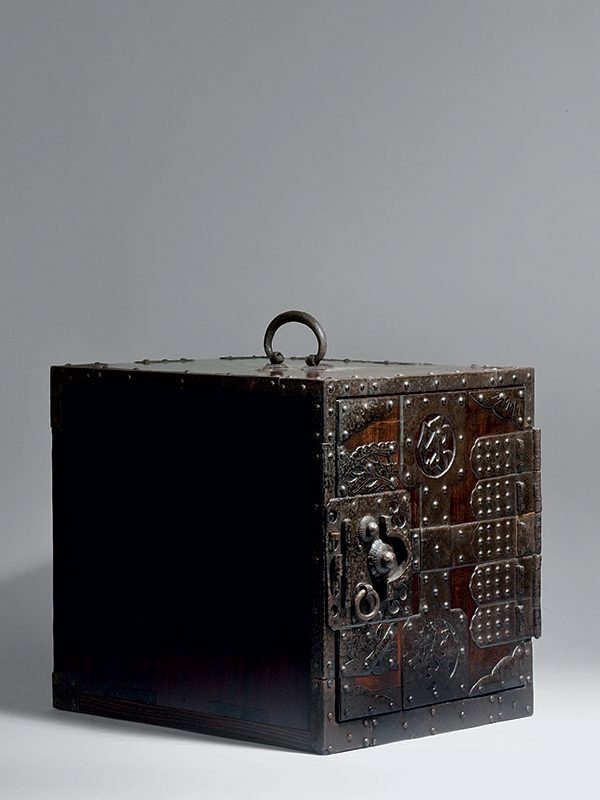 Chests like this were made from the Edo period (1603 ­- 1868) well into the Meiji period (1868 ­- 1912), and used on the small merchant vessels plying the Sea of Japan and the inland sea between Osaka and Hokkaido Island. The present example is of the kakesuzuri (‘portable writing’) type, made specifically for use by the captain or the ship’s owner for safekeeping ledgers and valuables. 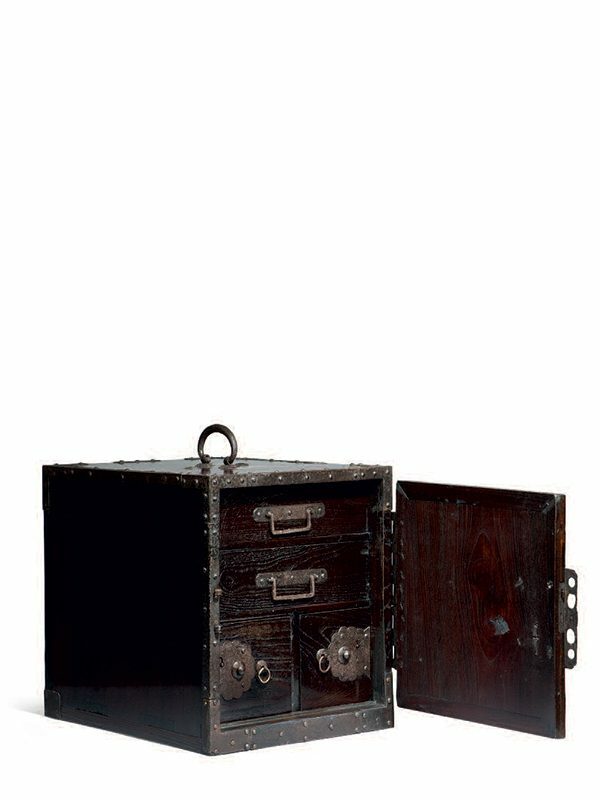 Chests with a fitted, lockable interior and with densely ornamental cut­iron mounts appear to have been made in the town of Ogi on Sado Island, a major port on the Sea of Japan trading route and the largest fun-a­dansu production centre of northern Japan. A closely comparable fun-a­dansu of kakesuzuri type, dated to 1839 is illustrated by Koizumi.